Freshen up a room, change your decor and give new life to old blinds. It's easy to do without spending much money. For the cost of a can of paint, you can change the look of your blinds rather than replacing them, which can be expensive. It's not complicated, either. There's a simple trick that will make the painting easy. Remove the slats. 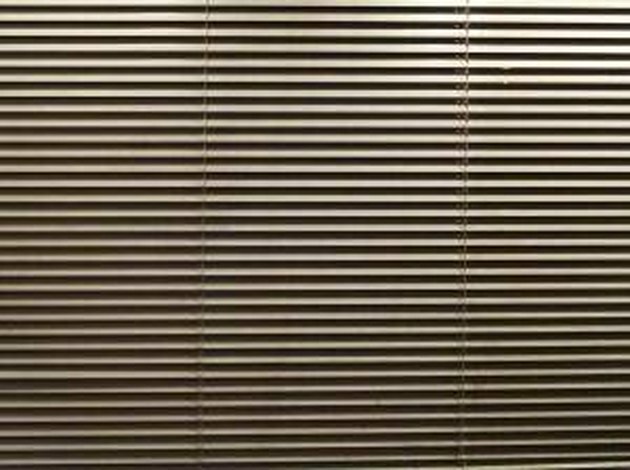 You don't want paint on the strings, or to spend hours trying to paint around them, so the real trick in painting blinds is to take the slats off the strings. Do this by lifting up the bottom rail and finding the wood or plastic pegs along the bottom. Use a flathead screwdriver to carefully remove the pegs and set them aside. Pull out the strings revealed when you removed the pegs and cut the bottom knot. Slide the bottom rail off the strings. Find the main strings and pull them up and out of all the slats, up to the headrail. Gather them neatly and hold them aside with a clothespin or clip so they don't get tangled. Then carefully, without twisting the strands, slide each wood slat out of the the threaded "rails" that support the slats. Clean the slats. Use a damp rag and wipe down each slat to remove and dust, dirt or fingerprints. Set the slats aside and let them dry while you prepare the paint and your work area. Paint the slats. Using a standard paintbrush, or a paintbrush made for varnish if you want a brushed look, paint one side of each slat. Let the slats dry and then turn them over and paint the other side. Make sure to cover the edges of the slats with paint since they will be visible. Paint on a second coat if needed. Return the slats to their positions. After the slats are completely dry, slide them back into their places on the "ladder." It doesn't matter what order they are put back in, but if they have any routing or other visual details, make sure they are facing the same way. Once the slats are in, pull the strings back down through the holes in the blinds, then pull the ladder threads and strings back through the bottom rail. Tie a knot at the bottom of each string and replace the plugs on the bottom rail. Make final adjustments. The bottom rail may appear crooked if the knots weren't tied at the exact same point on each string. This is not a problem. Use the cord to adjust the length of the blinds and even out the bottom rail. Then slide up the decorative bead at the bottom of the cord, tie a new knot to keep the adjustment you just made and cut off any excess string. Slide the decorative bead back down into place. How Do I Restring the Pulley System on My Bamboo Blind?